Blogging has slowed a bit while I work on a few writing projects. 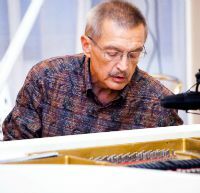 One of them involves notes for an album by the veteran Czech pianist Emil Viklický. It’s a collection of duets with a countryman, the young trumpeter, composer and arranger Miroslav Hloucal. Hloucal is little known outside of the Czech Republic. Based on what I’ve heard of him, I’d say that will change. In the meantime, a new video has shown up of Viklický, his trio and a guest performing at Reduta, the prominent Prague jazz club. The piece is Mercer Ellington’s “Things Ain’t What They Used To Be,” with Viklický, Josef Fečo on bass, Tomáš Hobzek on drums, and the Belgian alto saxophonist Steve Houben. Not a bad way to start the weekend.